Offering you a complete choice of products which include plastic modular belts. 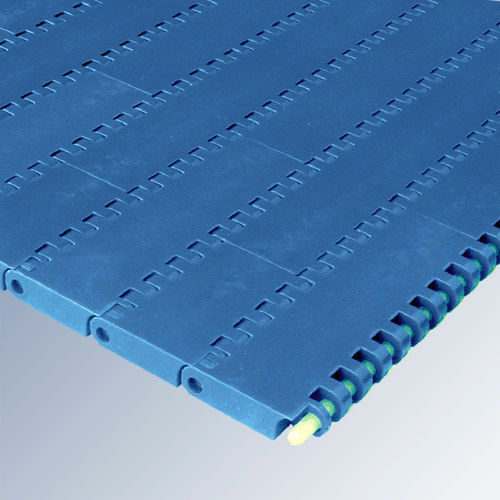 Plastic Modular Belts offer many advantages over conventional flat belt systems. These belts offer rugged yet flexible design features, which are increasingly used for food processing and conveying besides several engineering applications. As the name suggeststhe belts are made up of plastic modules arranged in staggered (brick wall) pattern assembled on full-length polymer hinge rods, which gives an inherent strength to the belt. The modules are held in place on the rods by end-locks. - Fruit and Vegetable Processing. - Meat , Fish and Seafood Processing. - Bakery and Snack Food. - Packed Juices and Beverages . - Feeding and Inclined Conveyors. Looking for “Plastic Modular Belts”?